I was at Northwestern University when I was diagnosed with a serious mental illness. For the next 22 years, I lived with chronic mental illness, going without a treatment that worked very well. Then, in 1994 two great things happened. 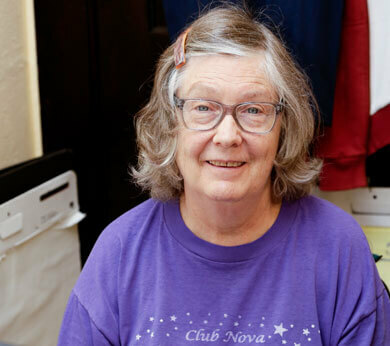 First, I started taking a new research drug that really worked and second, I joined Club Nova. Now I’ve known sanity in the process of mental health recovery. Back in the days of chronic mental illness, at some point, my father had me placed in Long Term Care. I was placed in a back ward at Dix Hospital. Staff members encouraged me to do sewing projects. For the next two years, I worked my way out of the hospital. I found a job at a local shopping mall women’s department store as an alterations person. I worked, yes, I worked, for ten years as a seamstress. But I kept from interacting with coworkers, and a person was lucky if I held the subject matter of a conversation. When I first started at CN, I was, for the most part, unresponsive to my environment, to others. I projected negative symptoms: seldom listening to what’s said, but instead listening only to what I wanted to hear, and not sensing other’s feelings about adult everyday activities. After the research med began taking effect in 1994, I began telling laughable stories, jokes, studying well how different groups and individuals responded differently to my same stories, and slowly began to look out for, listen to the needs of others. Let me say my reactions are only one reaction to one’s environment, one set of symptoms. Others here at Club Nova may be sad one moment, happy the next and indifferent the next; others are hearing voices; and still others depressed. I have worked off and on for many years, including since I came to Club Nova. I have worked mostly as a cashier, but I also loved being a Resident Manager at Caramore. I have times when I cannot work and I have to be hospitalized and go through a recovery period. One day, the staff at Club Nova asked me to enter data into a database as part of the Work-Ordered Day. Now I do productive work including entering data into the PC, filing, reception, and proofing attendance. With Club Nova’s encouragement, I went to college part-time at Durham Tech and earned an associate of art’s degree. I then went to UNC part-time for two years, majoring in psychology, but did not attain a degree. In 2013, I moved into my own apartment behind Club Nova, where there is support. That year, I also attended an International Center for Clubhouse Development seminar in St Louis, Missouri, That was exciting. The Clubhouse remains a place of vibrant interactions with others who have experienced mental illness, giving it a sense of community: a place to come, a place for meaningful employment, a place for meaningful relationships, and a place to return…….